RPG Maker MV gives you a way to offer choice selection to your players through events, and depending on the choices they make, the game will respond differently. One thing that it doesn’t support, however, is the ability to hide certain choices from view. For example, if you wanted to offer your players a list of quests that they can complete in any order that they wish, and to remove any completed quests from the list, your only option is to create multiple conditional branches for each combination of quests that are currently available, and create separate choice lists for all of those combinations. 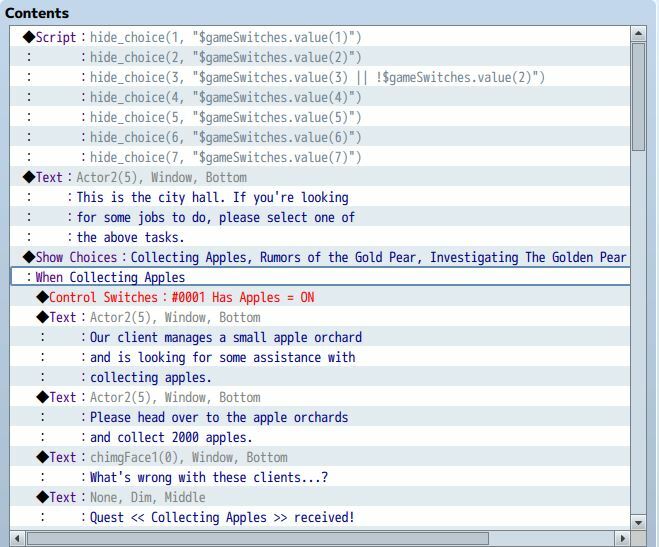 With this plugin, you can use a simple event call to hide a choice. Combined with conditional branches and other event commands, you can tailor your events to your needs quickly and easily! For perspective, this is how the event in the video is set up. Want to hide some choices? Try this plugin out! Due to the way this plugin works, this plugin must be placed below other choice-related plugins! In your plugin manager, make sure the order of the plugins are suitable. Download the plugin and place it in the “plugins” folder in your project’s “js” folder. Then open your Plugin Manager (F10), double-click an empty row, and select the HiddenChoiceConditions plugin. Take a look at the image above. The numbers along the left is how choices are numbered. You will use these numbers when hiding choices. There are two ways to hide a choice. Where the choiceNumber is the number of the choice that you would like to hide. You can use conditional branches to determine whether a choice should be hidden or not. The following diagram shows how you might set up your event with hidden choices. When you create a hide choice command, it will only apply to the next set of choices down the list. 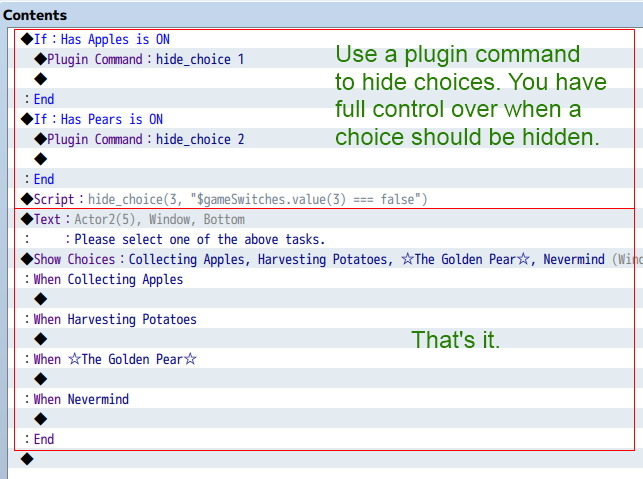 If you have two sets of choices, you will need to create hide choice commands for each set. How can I disable a choise after i select it. Choice 1: Are you ok? Howdy! Great plugin, I use it with Large Choices. However, hide function is not working for me, if script call and show choices are inside common event. Should it be like that? If yes, how can I set up and make it work for all the maps without copy pasting same large choices and all the scripts for each choice to every event? Wait, it’s also not working from autorun event when I turn on the condition switch from another event. I want to: 1. have one autorun or common event for Large choices and scripts for hiding each choice and then 2. start this autorun/common event from other events when needed. Possibru? Nvm, I used plugin command for a script, all works like heaven and whipped cream. Hi Hime, thank you so much for this plugin! It helps a lot! and have the hidden choices plugin activated, then none of these options show. Do you know what I’m doing wrong? I have a problem. If i add the script call : hide_choice(1, “$game_variables < 3″) ,, it gives me back the error massage : ” Reference error : $game_variables is not defined . ” . Any idea why? Thank You ! To access the value of game variable 1. Works beautifully! One issue I’m encountering has to do with default choices. 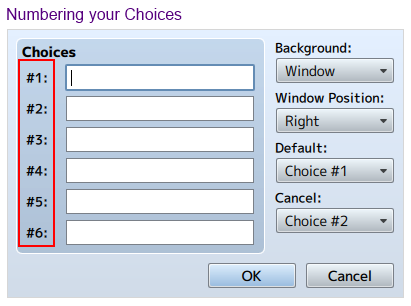 I have a show choices with 3 choices, defaulting to the 1st choice. After that choice is selected, it runs the same show choices again, only hiding the first choice. However, this means that the default choice is now hidden, and no default selection appears. It’s not that big a deal obviously, more of a consistency detail. But if I have a default choice show up in the first iteration of the choices, is there a way to have the default choice bump down one choice if the default choice has become hidden? Aha, it was a conflict with the Yanfly Extended Message plugin. Now the next choice down properly gets default cursor. The Yanfly hidden choice solution seems a little inelegant — when choices are hidden, the choice box does not resize to fit the smaller set of choices. Hime’s solution does! Good to know about the compatibility issue. For the most part, since yanfly’s plugin is meant to provide hidden choices, it wouldn’t make sense for me to make my own hidden choices compatible with it since I’d basically be overwriting his implementation. Hello! I’ve tried using this plugin along with your Large Choices plugin, but I’ve encountered some problems. It works well if I try to hide a choice from the first set of choices, but any of the choice sets below that either aren’t affected if you list them as choice 7/8/etc., or if you put the conditional branch with the ‘hide_choice’ plugin command before the second choice set, it splits them into two separate choice dialogues. Is there a way for these two plugins to work together? By the way, both of your plugins that I’ve used are amazing on their own, and have really given me hope for the little project I’ve been fiddling with! It works for me. I created two sets of choices with 4 options each one after another, and I see all 8 options. Then I make a plugin command to hide_choice 7 and the 7th option is hidden. You will need to determine whether there is another plugin that is causing the compatibility issue, or perhaps your condition isn’t working properly. I was trying to use this plugin for unlocking dialogue choices, i.e. the option to talk to an NPC about something if the player is friends with them. I tried to hide the option immediately upon running the event if the friendship variable isn’t high enough. However, it seems like the plugin hides the choice only after the event has run… Am I doing something wrong? The plugin is designed so that it will hide the choice when the plugin command or script call is made. These should be made before choices are shown. Try putting together a simple test event where you start by making a plugin command called “hide_choice 1” and then show two choices that say “Yes” and “No”. What should happen is only the “No” choice is shown. If that doesn’t work, try disabling other plugins first and then see if it works. Sorry for the late reply! I just wanted to confirm that it’s working now. 🙂 I tried it with the test and it worked perfectly. I had my original event running as a parallel process (which was silly and unnecessary for the event anyways) and switching it to an autorun fixed the problem.